'Eleven months of the year, I lived in a perpetual state of holly-jolly fanfare. But by the time the first of November rolled around, I was completely Christmased out. I know I sound like a Scrooge to admit such a travesty, but believe me, when you build a career on Christmas cheer and holiday hype, the warm fuzzies of nostalgia fade faster than Hollywood's latest scandal. Hollywood knows her as the 'Holiday Goddess'. Lenox knows her as Georgia Cole. Georgia has her December holidays all planned out. A remote getaway in the Hawaiian Islands is calling her name and she can hardly wait to take a break from writing clichéd Christmas screenplays. No snow for this girl - bring on the palm trees, sandy beaches and fruity drinks! The very last place she expects to be for Christmas is Lenox, Oregon. But when Georgia's grandmother volunteers her to direct a pageant at Lenox's community theater, Georgia finds herself heading back to her hometown for the first time in seven years. He's known as the Lenox Heartbreaker. To Georgia, he's the man she left behind. Weston James. Once her childhood friend and crush, he's now the one man Georgia can't forgive...or forget. But he's also the man she has to work with in order to make the pageant a success. As the two work side by side, will they be able to overcome the past that divides them? Or will Georgia's fears cause her to miss out on a second chance at love? Thaw your heart this Christmas with a heartwarming tale that puts true love to the test. 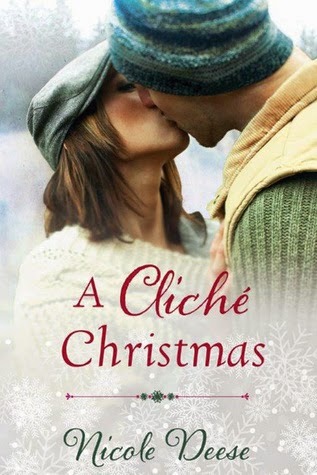 Refreshingly honest and beautifully written, A Cliché Christmas is anything but cliché! Emphasizing the importance of family, love and making memories, it's a book you're going to want to have on your bookshelf these December holidays. Be prepared to add A Cliche Christmas (and Weston!) to your Christmas list! Firstly, I'd like to thank Nicole Deese for the opportunity to read and review her book. Her books are original and touch readers' hearts, and I am honored to have had the chance to read A Cliche Christmas and experience the magic first hand. Contemporary romance is a tricky genre to write - and to read! Quite honestly, it's a minefield of clichés waiting to happen. Readers, consciously or unconsciously, will pick up a contemporary novel with preconceived ideas as to what is going to happen. I recently got an email from a bookworm friend of mine. She was inquiring about a contemporary romance I'd read and that she was thinking of reading too. She included a list of elements she wanted to know if the book had in it. These included 'the guy and girl break up' and 'an ex-girlfriend gets between them', among others. We both agreed that clichés like this are so common in contemporary novels nowadays. It starts to become almost comical how predictable the books' plots are, just by scanning the blurb! But A Cliché Christmas stands apart. If you've had the pleasure of reading Nicole Deese's Letting Go series, you'll know that her book plots and characters manage to entertain as well as inform. A Cliché Christmas is no different. Although the story carries holiday themes, pageants, hot guys, and drama along the way, you don't find any of it overly familiar. You don't sigh, thinking 'Gees, I wonder where I've read that before?' Because Nicole adds reality into the mix. Her characters have real problems. They deal with them in real ways. #9. ...and everything in between! A quick note: A Cliche Christmas is available at Warlmart starting the first week of October! For those of you who do spot it, if you get the chance to take a 'selfie with a Cliche Christmas' it'd be a great help in spreading the word about this beautiful book. Six Spooky Books for Halloween!